A couple of months ago, I wrote about how Ellie has discovered that she looks different from other kids. Her hemangioma caught her eye after a bath one day, and really disturbed her. I talked to a nurse friend from church because at that point, we were starting to worry about future psychological issues. Taking her out in public resulted in people saying things, and she was beginning to understand that they were talking about her. Sean and I, Cheryl the nurse, and Debbie, our occupational therapist, all agreed that her hemangioma was getting bigger instead of smaller, so we took her to a plastic surgeon for a second opinion. Up until that point, we had been talking her to a children's dermatologist, but they weren't doing anything except watching it. As soon as the plastic surgeon at a different hospital saw her, he said that it was time for it to go. Dr. Brian Andrews, our plastic surgeon, gave us a couple of different options, but ultimately recommended surgery because of how the hemangioma was behaving. What Exactly Is a Hemangioma? Hemangiomas are non-cancerous tumors that typically grow for the first year, and then shrink until they disappear by kindergarten. 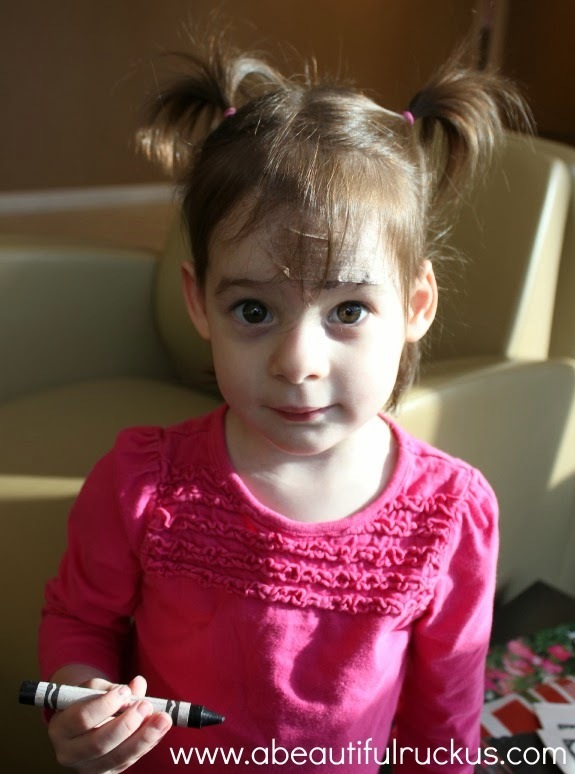 In Ellie's case, her hemangioma grew so quickly that it ulcerated during the first year. It caused her intense pain, and while it healed, we were told that it would cause scarring. The dermotologist then put her on Propranolol, which is a heart drug that also slows the growth of hemangiomas because it is a beta blocker. The idea was to use it until she passed the age when it should stop growing, and then take her off of it since it can't be used for long periods of time. Unfortunately, as soon as the doctor took her off, it started growing again...and didn't stop. With Ellie already being 2.5-years-old, we could tell that something was different about hers. We were thrilled to get Dr. Andrews as our plastic surgeon, especially since I blindly called the hospital and asked for an appointment with anyone. 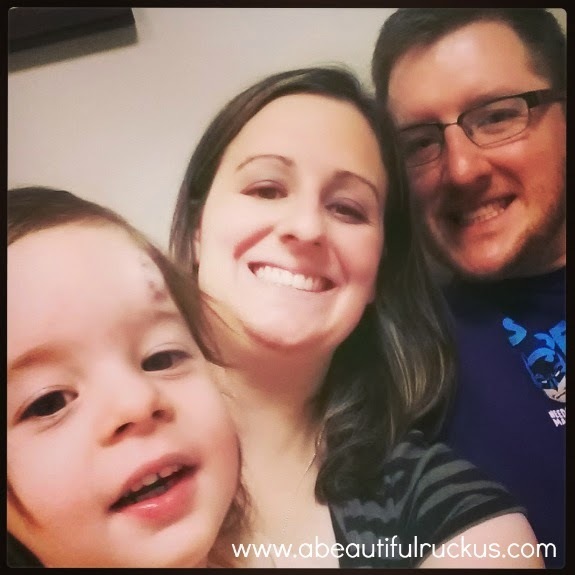 When we first met him, he walked into the examining room, popped himself up on the examining table, and then let his legs swing off the side while he talked to us and watched Ellie run around the room. It was nice to meet a doctor who was so laid back and personable. He has a great bedside manner, and interacted wonderfully with Ellie. Ellie wasn't afraid of him at all, and he took his time working with her. I'm really thrilled that he was the doctor that we ended up with! So three weeks ago, we found ourselves up at 4:30am in order to be at the hospital by 5:30am. Ellie was a great sport in spite of being up early, and we spent our wait time coloring and roaming the halls of the hospital until they took her back. Ellie thought it was great because she was getting special time with Mommy and Daddy while her siblings stayed home with Pa and Ma (Sean's parents). 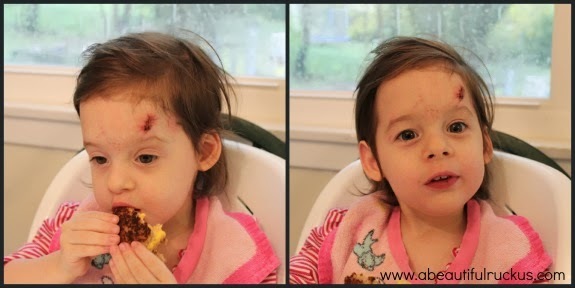 Hemangioma Surgery on the Face...How Does That Work? Dr. Andrews recommended that we go with a two step surgery. The first step would be to remove the hemangioma in a circle, and then cinch the edges closed. Do you know what the top of a cloth purse looks like when the drawstring is pulled tight? That's what the incision looks like after the first surgery. Then, 6-8 months later, there will be a second surgery to turn it into a straight line suture. When all is said and done, it will look just like a crease in her forehead. The other surgery option was to just close it in a straight line suture the first time. The problem with that was that it would pull her eyebrow up and her hairline down permanently. Since we are trying to move away from her looking different, that wasn't an option at all. So we went with the two step surgery process. Thankfully, Ellie's first surgery went really well and she had no issues. We were a bit concerned that they would nix the surgery when we got there as she had been sick the week before, but the anesthesiologist cleared her, so they were able to do it after all. Thank goodness, because I really don't like getting up at 4:30am! Guess how long that hat lasted when we got home? 10 minutes is about right. :) But because of all of the layers, she could have taken off the top four layers before there would have been cause for concern. Happily, her recovery was very easy! She was given a prescription for Tylenol with Codeine for pain, but only needed it for about 36 hours. The doctor told us that the pain level would be the equivalent of a really bad rug burn. I honestly doubted that, but sure enough, she was playing and eating like normal within a few hours of surgery. Other than being a little tired, you'd never have guessed what happened by evening the day of her surgery. Ellie sporting four of her five layers of bandages. So now we are just doing follow-ups for the next 6-8 months to make sure that this first round of surgery heals well. The bandages have all been removed, and Ellie is down to just the stitches. She was a champ when Dr. Andrews removed the bandages even though it pulled on her wound a bit. He was gently trying to remove the center of the bandages where the glue was sticking, but Ellie decided enough was enough. 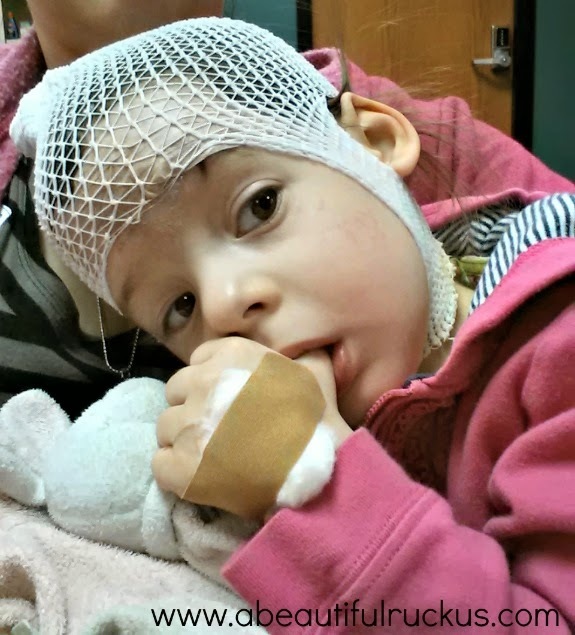 She reached up and yanked that bandage off of her head and handed it over. Yeah, that hurt, but she moved so fast that we didn't realize what she was doing. Yikes! But the tears were quickly dried up when Dr. Andrews asked her if she'd like to pick a treasure from his treasure box. Did I mention that this doctor isn't just a pediatric plastic surgeon? Even though he works with adults as well, and teaches medicine at the University of Kansas, he still took the time to stock a treasure chest with prizes for little kids like Ellie. We really appreciate how hard he works to relate to Ellie and make her comfortable. 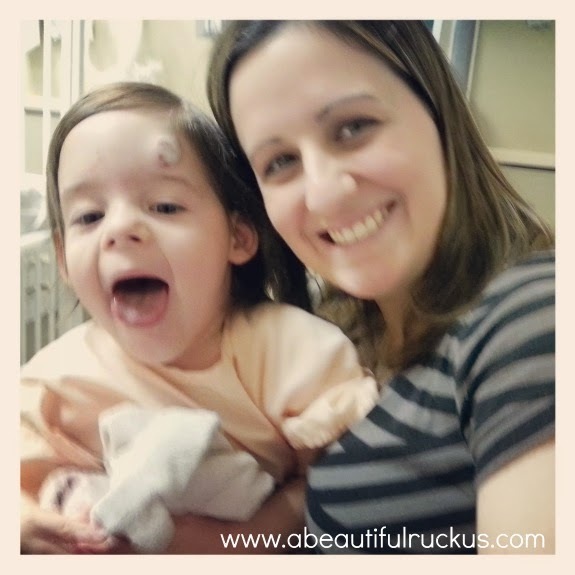 What does Ellie's Hemangioma look like now? I took this photo about two weeks after her surgery. Her surgery site is about as noticable as the hemangioma used to be, but should smooth over the next few months. As for Ellie, she thinks it's pretty awesome that she gets to wear Mickey Mouse bandaids that Sean's mom picked out for her. We are adding a little antibiotic ointment to the bandaid per Dr. Andrews to finish dissolving the glue. No need to pick at it more than necessary! That's a long update on Ellie, so thanks for hanging with me. We are trying not to draw more attention to the incision than necessary. One of the reasons that we had the surgery in the first place is to get rid of the questions from strangers about whether she fell and needs ice, etc. If you see us out and about, we'd sure appreciate it if you didn't call attention to it or mention it in front of her. She is such a confident little girl, but there really is no point in making a big deal about it. She looks a little different now, but hopefully within a year, you will barely be able to tell she ever had anything on her face at all! What a little sweetheart you have there. I'm sure it will be fine once it is all healed up. Sounds like your surgeon was very nice. We've had good experience with surgeons too. I'm glad there are people in the world who like being surgeons--it's not something I would want to do. What a little sweet heart! I am glad she did so well with the procedure, and it definitely helps to have a great provider! Everest has a hemangioma on his chest, under his arm. He is 4 now, and while it IS shrinking (slowly) he gets questions over the summer and seemed to get upset about it at 1st, now he just says "Its a hemangioma, do you have one, too?" I think it looks amazingly good. It hasn't been very long. I am sure it will heal nicely and not be4evident when the surguries are complete. 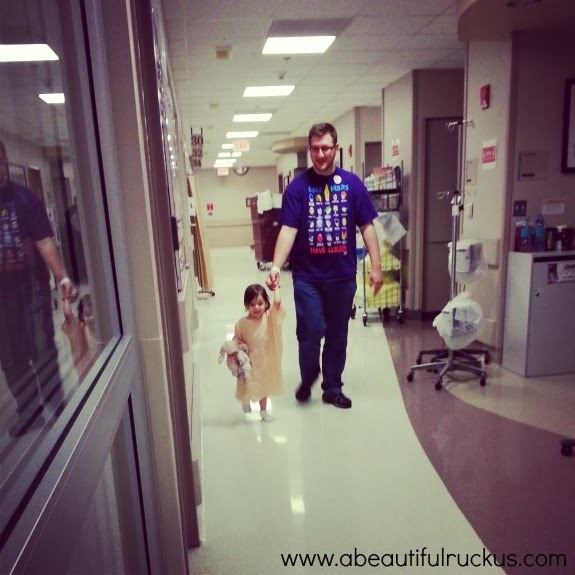 My cousin who is a pediatrician went through something similar with her daughter. The hemangioma grew and ulcerated. They put her on steroids...that did shrink and fade it some...but it did not disappear like it was supposed to. Around age 3 she had surgery to remove what was left, and just has a little tiny scar on the side of her nose. Nothing major...and she is now a happy healthy teenager. Ellie looks like she is handling this all so well. Will pray it continues to heal up nicely and for her next surgery to go well also. Sounds like that surgeon is awesome. Always nice when they know just what will make children feel more comfortable. So glad things went well and you had a great surgeon! It sounds like you guys made the right choice. Ellie is beautiful no matter what, but I think you will all be glad you did this. It looks like it is healing nicely. Blessings! thankful for Ellie's wonderful doctor - both skilled and caring. oh my, what a shock when she tore off the bandage. little ones sure can be quick! you explained the two-step surgeries very well. sounds like a very effective method. God bless.